The Spyderco Manix2 Sprint, like the original Manix2, is an amazing knife. The Manix2 Sprint takes the design of the original Manix2 and lightens it up with skeletonized steel liners and a flat ground blade. 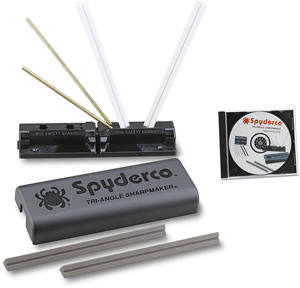 The Ball Bearing Lock locks the blade up tight and can be operated easily with either hand. The handles are made of coarse G10 and have aggressive jimping, which combine to form a top notch grip. The Manix2 Sprint is only available for a limited time and with limited numbers, so check it out now or take a look at the other Spyderco products at www.knifecenter.com. The Spyderco Manix2 has enjoyed a welcome reception since its release in early 2010. Spyderco’s Sprint Run Manix2 will feature Carpenter Steel’s CTS-BD30P steel blade and coarse-textured black G-10 handle available for only a short time and in a limited number. 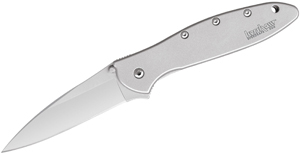 Carpenter Inc.’s CTS-BD30P blade steel is equivalent in performance and components to the knife industry’s Gold Standard in powdered-technology created steel, Crucible’s CPM-S30V. 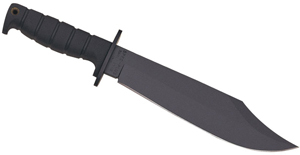 The blade is flat ground with aggressive thumb serrations (jimping) and an oversized 14mm Spyderco Round Hole. Coarsely textured, the black G-10 handle features an exceptionally strong lock called the Ball Bearing Lock®. It operates with a free-floating ball bearing contained in a custom-engineered high-tech polymer cage. The spherical ball bearing allows the lock to self adjust across a large surface, smoothly and consistently locking up with solid confidence. Nested in the handle scales are skeletonized dual steel liners for increased rigidity and strength without unneeded bulk or weight. The liners are scalloped, extending slightly beyond the handle scales creating textured jimping around a large portion of the handle’s perimeter. The Sprint Run Manix2 showcases the commitment to innovation and quality Spyderco offers in an undeniably unique folder collaboration.